NETWORK UPDATE: 2 BROKE GIRLS and MIKE & MOLLY each rose 0.1 in final numbers. CABLE HIGHLIGHTS: Round 2 of the NBA PLAYOFFS was on TNT, and they were the top 2 shows of the night at 1.93/1.80. VH1’s LOVE & HIP-HOP ATLANTA lost 0.23 to 1.41, and an AFTERPARTY lead-out was at 0.98, down 0.21 from last week’s edition. With all three hours now included in the charts below, WWE (USA) was at 1.15-1.03 over its 3 hours. TEEN MOM gained 0.06 to 1.13, and its lead-out special was at 0.69, up 0.01 from last week’s, with TRUE LIFE following at 0.28. On A&E, BATES MOTEL dropped 0.04 to 0.68, but THE RETURNED rose 0.05 to 0.34. Bravo’s SHAHS OF SUNSET dropped 0.03 to 0.54, and SOUTHERN CHARM lost 0.08 to 0.44. History’s SWAMP PEOPLE fell 0.07 to 0.53. 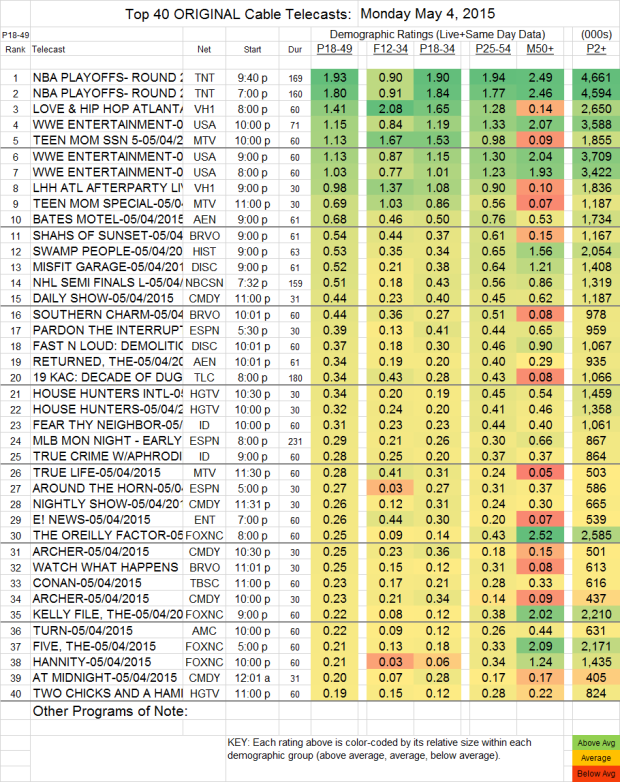 On Discovery, MISFIT GARAGE was down a tenth to 0.52, and FAST N LOUD: DEMOLITION was at 0.37. TURN (AMC) surged 0.09 to 0.22. RUPAUL’S DRAG RACE (Logo) lost a tick to 0.16.